For so many nerds, the Hubble space telescope feels more like a friend than a hunk of metal in the cold vacuum of space—a friend whose job you’re super jealous of. The ‘scope, which launched on the space shuttle Discovery in 1990, has sent back some of the most incredible images from the final frontier—over 1.3 million observations of planets, galaxies and more, all while hurling about our planet at 17,000 miles per hour from its vantage point in low Earth orbit. Today just so happens to be Hubble’s 27th birthday. This salty ol’ girl, which has outlived NASA’s most optimistic predictions by more than a decade, is finally old enough to vote, gamble, and even rent a car, though she just missed the cutoff for remembering the ‘80s. In lieu of cake, we’ve compiled the telescope’s most timeless pictures, which is really more of a present for us. This stunning close up of a galactic pair was released on April 20th, 2017 (nice), just in time for Hubble’s birthday. These galaxies—called NGC 4302 and NGC 4298—are located roughly 55 million lightyears away, and both are smaller than our own Milky Way. According to Hubble’s site, although the two appear quite different due to the angles at which we see them, the galaxies are actually very similar in composition. It’s hard to believe this image, which looks exactly like an R.E.M. album, is actually real. A composite shot of Europa, overlain on Hubble data taken on March 17th, 2014, the image marks some of the best evidence yet for erupting plumes of liquid water on Jupiter’s icy moon. This is one of the reasons scientists are currently interested in exploring Europa—and even drilling into it—in order to find biosignatures. Thanks, Hubble! Is there anything more breathtaking than this Lisa Frank-looking nebula? Methinks not. The picture, which was taken in April 2015, shows the beautiful garbage left over from the explosion of a star thought to be 20 times more massive than our Sun. According to Hubble, the Veil Nebula is about 110 lightyears across, though its gorgeousness is infinite. This M83 is not a French electronic rock group, but it is pretty darn lovely. Located 15 million lightyears away in the constellation Hydra, this galaxy is full of star clusters, which pop in this composite of several exposures taken between August 2009 and September 2012. Its signature pink glow comes from its younger stars (1 to 10 million years-old), which absorb ultraviolet light and give off a hydrogen aura. You can check out the rest of the telescope’s stunning images here. 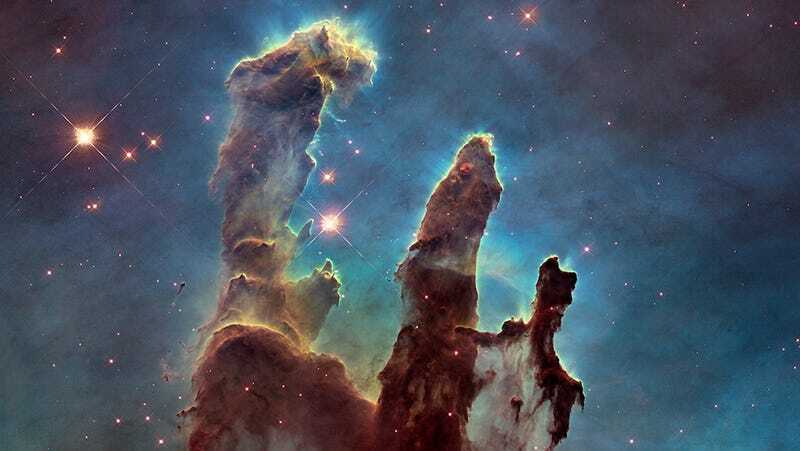 Happy birthday, Hubble, and here’s to many more!